Would you like to spend a special evening listening to some of the most famous operas in the world, without the need to go to a full opera? The Odeon theater hall just off Piazza Strozzi and the Ensemble San Felice present a new initiative for lovers of classical music. 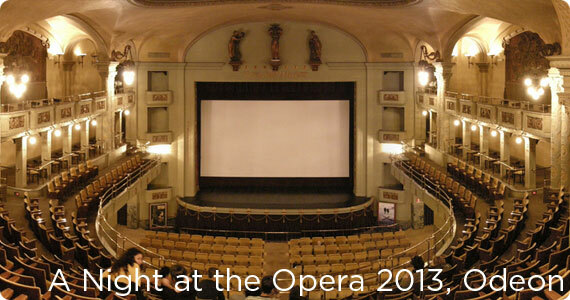 A “Night at the Opera” offers a series of evenings of concerts and famous Italian operas in a reduced scenic stage (singers with accompanying piano) but with full screen video projections within the splendid art decò Odeon theater that offers exceptional acoustics. One of the most popular operas about the tormented and overwhelming love affair between the courtesan Violetta and the young Alfredo Germont. His father, Giorgio Germont, is against their marriage. Will they be able to be together? A touching story, set in Paris, on the love between the poet Rodolfo and the florist Mimi. The carefree life of bohemian Marcello, the painter and Musetta the showgirl is the background to the tragic epilogue. An exciting selection of some of the most charming concerts and Cantatas of the Italian genius Antonio Vivaldi. Highlights from Giuseppe Verdi’s Operas: Aida, Rigoletto, La Traviata, Il Trovatore.